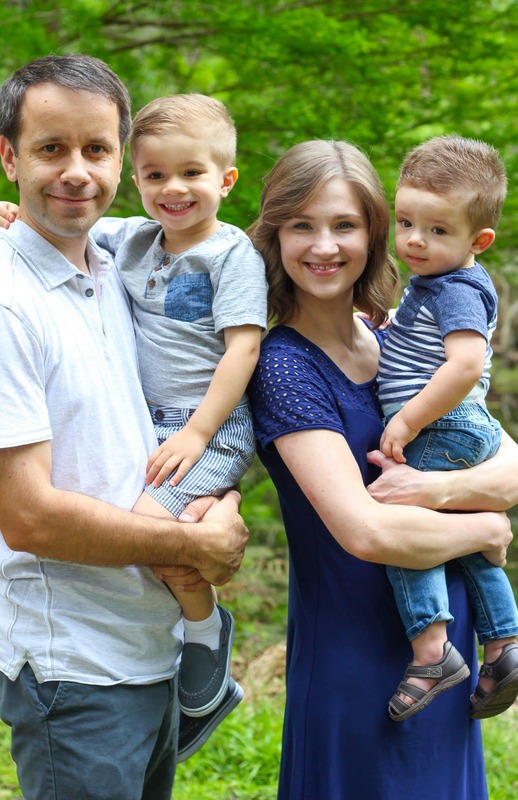 This has been a really exciting spring for us, since we are finally getting a house. Yay! 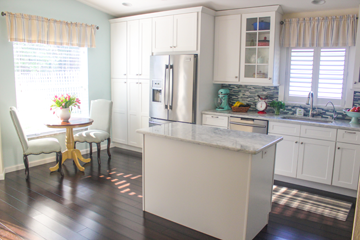 House hunting is another activity that has brought Sergi and myself even closer to each other. There are so many things to talk about and so many decisions to make. After living in apartments for almost 8 years, we are beyond thrilled to be looking for a place of our own. I am really looking forward to having a backyard and growing some vegetables. A garden has always been a big part of my dream for our future home. My parents planted a garden every spring and we spent all summer and fall enjoying the bountiful harvest. Even though there is a lot of work involved, I am a nature loving gal and love most of it. Trust me, I remember the weeding, worrying about wildlife eating the beets and radishes, and either too much or too little rain. It’s a rewarding kind of work though. Since we are still very much apartment living folks, we make do with farmer’s markets and grocery stores, that at this time of the year are starting to spill over with gorgeous arrays of lovely vegetables. Zucchini has made its appearance and I’ve been preparing it in many different ways. I wanted to try something a little different than my usual fare, so I made a Zucchini and Tomato Frittata. My favorite pairing with zucchini are tomatoes, so this was an absolutely delicious combination. It’s risky baking zucchini and tomatoes in a tender frittata, since there’s a risk of ending up with a mushy, watery concoction, but not in this case. The zucchini is still vibrant with just the right amount of crispness, and the tomatoes are still juicy, sweet and roasted, but not disintegrated. 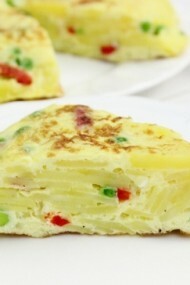 The frittata can be enjoyed in so many ways, at breakfast, brunch, lunch, dinner and or even a midnight snack. I packed it with me to take to work and it was even good cold. Preheat the oven to 375 degrees. Brush a 9 inch round pie plate with 1/2 Tablespoon of oil. Heat 1/2 Tablespoon of olive oil in a skillet. 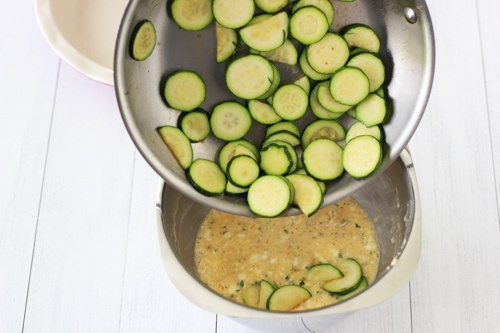 Add the sliced zucchini and cook for about 3 minutes, seasoning the zucchini with salt and pepper. The zucchini should still be a vibrant green color, but should have softened a bit. Set aside to cool a bit. 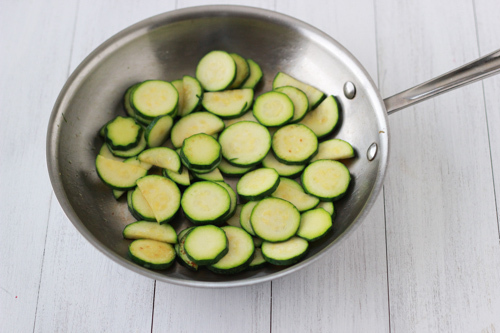 Sautéing the zucchini first starts the cooking process and takes out unwanted moisture out of the zucchini. 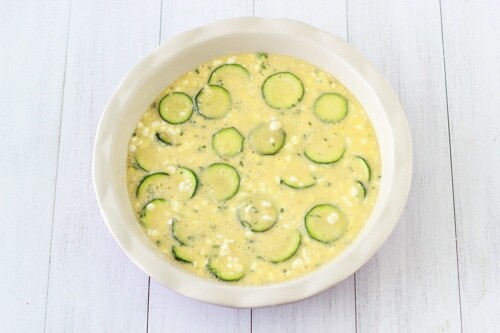 If you add the zucchini raw to the frittata, it will still be partially raw, crunchy and will exude a lot of liquid as it cooks and you will end up with something very unappetizing. Plus, sautéing the zucchini adds so much flavor to it. 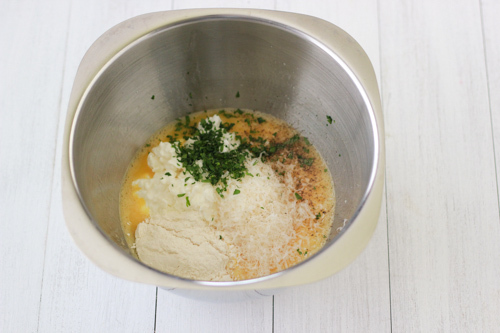 Meanwhile in a medium bowl, whisk the eggs. Add the cottage cheese, Parmesan cheese, 1/4 teaspoon salt, black pepper, flour and 1/2 Tablespoon fresh minced parsley. Mix to combine. 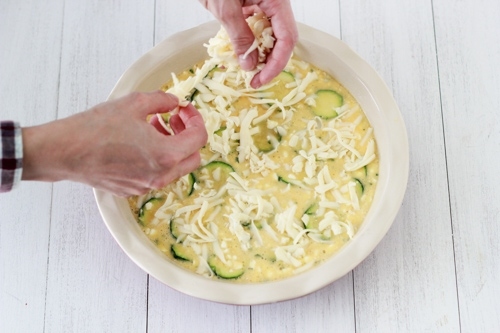 Add the slightly cooled off zucchini to the cheese and egg mixture. Pour the mixture into the prepared pie plate and even it out. 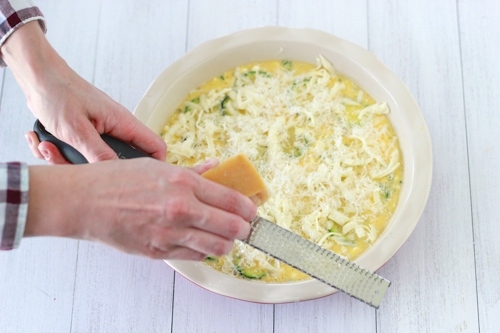 Sprinkle the Mozzarella cheese on top of the frittata and shred a little bit more Parmesan on top of it as well. In the same skillet that you used for the zucchini, heat another 1/2 Tablespoon of oil, and add the sliced tomatoes and 1 minced garlic clove, seasoning with salt and pepper. Cook for only a minute, just until the garlic is fragrant and the tomatoes release some of their liquid. 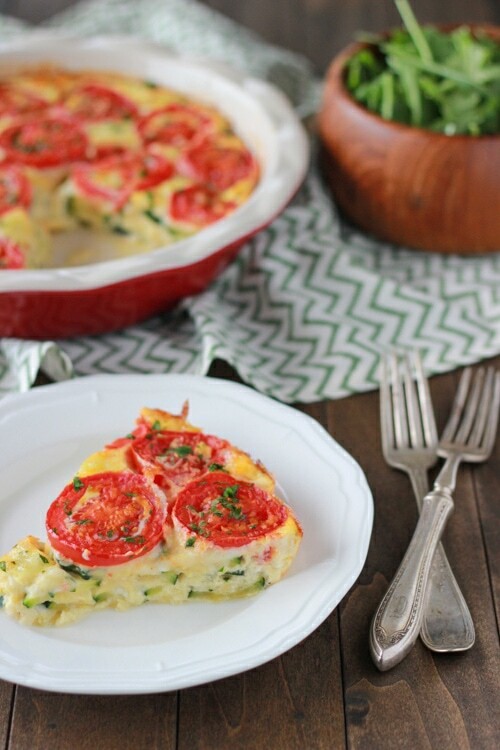 This small step will help out a lot in having a frittata that’s not leaking with tomato juices. Precooking the garlic gives it a more mild taste and adds that flavor to the tomatoes. If you would add raw garlic to the frittata it would be really intense and pungent. 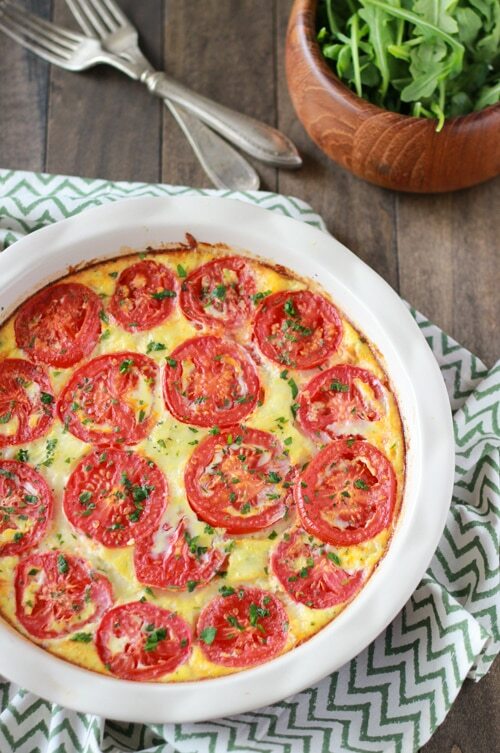 Place the tomatoes in a circle on top of the cheese on the frittata, leaving the liquid behind. 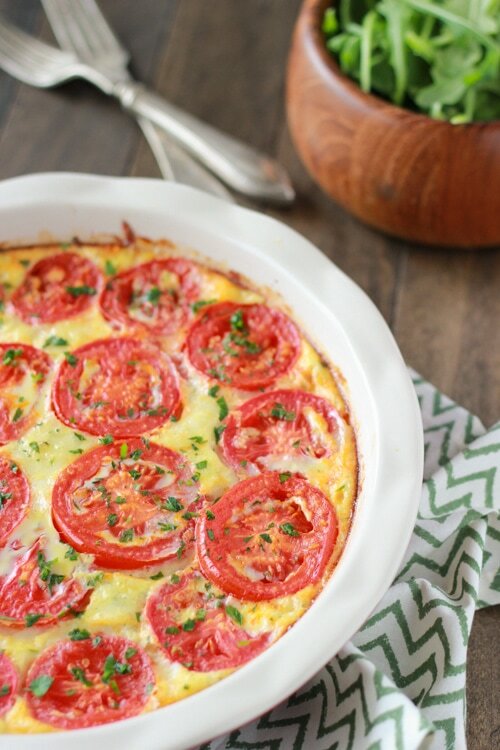 Placing the tomatoes on top of the cheese is another step to having the perfect texture in the frittata. Sprinkle with a bit more fresh parsley. Bake in the preheated oven for 30-35 minutes, until the edges are golden brown and the fritatta is set. Preheat the oven to 375 degrees. Brush a 9 inch round pie plate with ½ Tablespoon oil. Heat ½ Tablespoon of olive oil in a skillet. Add the sliced zucchini and cook for about 3 minutes, seasoning the zucchini with salt and pepper. The zucchini should still be a vibrant green color, but should have softened a bit. Set aside to cool a bit. Meanwhile in a medium bowl, whisk the eggs. 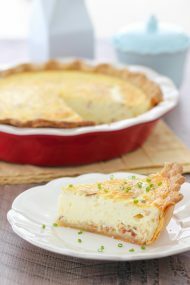 Add the cottage cheese, Parmesan cheese, ¼ teaspoon salt, black pepper, flour and ½ Tablespoon fresh minced parsley. Mix to combine. 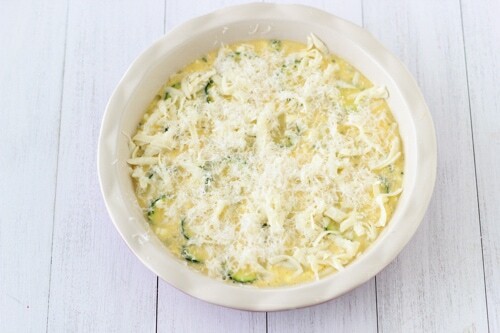 Add the slightly cooled off zucchini to the cheese and egg mixture. Pour the mixture into the prepared pie plate and even it out. Sprinkle the Mozzarella cheese on top of the frittata and shred a little bit more Parmesan on top of it as well. 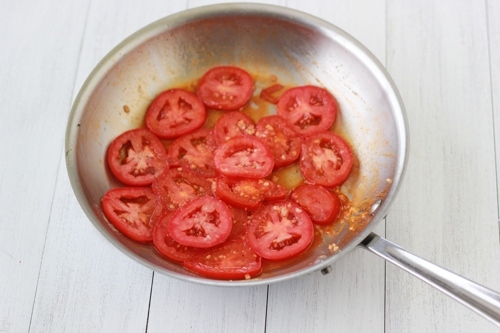 In the same skillet that you used for the zucchini, heat another ½ Tablespoon of oil, and add the sliced tomatoes and 1 minced garlic clove, seasoning with salt and pepper. Cook for only a minute, just until the garlic is fragrant and the tomatoes release some of their liquid. 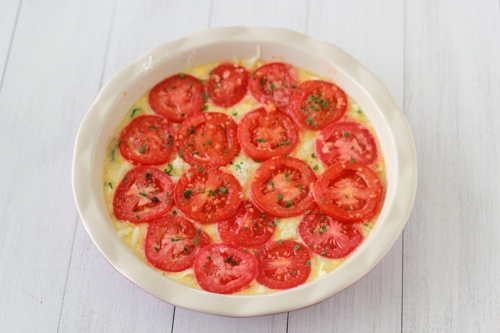 Place the tomatoes in a circle on top of the cheese on the frittata, leaving the liquid behind. Sprinkle with a bit more fresh parsley. Bake in the preheated oven for 30-35 minutes, until the edges are golden brown and the fritatta is set. Hi, Dear Olga and all your family! I perfectly understand you and so happy for you guys!!! We bought our house three years ago and it still a lot of work, But we are so happy, especially me. I love our backyard and grow a lot of veggie and fruit, berry, herbs. It’s so bit advantage to take fresh parsley, dill, basil from my yard. And smell WOW you never buy the same at any market. I love to make my own ketchup, preserves, pickles etc. Sorry for teasing you but I’m 100% sure you will have all this staff and even more pretty soon. THANKS MUCH for great recipe. We have zucchini at my backyard, just need to buy tomatoes because ours are still green. But pretty soon I will have my own veggie for this great recipe. Cannot wait to try this. Maybe tomorrow! NOW you will be even busier than before. I know but it good to be busy. Good luck in your new journey to be the house owners PLUS your previous choirs. Thanks so much Nina! We are really, really excited! We’re thrilled to be buying a home and the backyard is definitely a high plus for me. The garden, grilling, and just relaxing in the sunshine. I’m sure we will be busier, but it will be fun. Thanks for the support! I’ve made this deliciousness this week and it was a hit. Simple ingredients yet the results were outstanding. 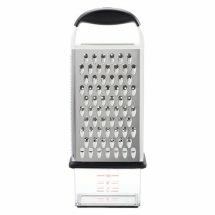 I substituted mozarella cheese for swiss/cruyere cheese blend. Will make it again when I’ll have veggies from my garden. Thank you, Olga!!!! That’s awesome, Lana! I’m so glad you liked the frittata. This looks really good! 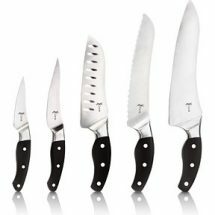 I have tried a lot of your recipes and they have always been great! Have you tried making this a night before and then baking it in the morning? Awww…. I’m so happy to hear that, Katrina! Thanks for being a loyal reader. I’ve never tried prepping it a night ahead of time. If you try it out, let me know how it works. Oh, it turned out absolutely delicious!!! My whole family enjoyed it! It’s great for breakfast or a late dinner – light, yet satisfying, load of veggies (I’m big fan of that). I added sautéed mushrooms on top of zucchini layer, because I love mushrooms. Thanks for a great recipe! I am such a fan of veggies too, Natasha. The more the better:). Great addition with the mushrooms. Do you think I could skip the cottage cheese in this recipe? I can imagine it makes it taste so much better, but I don’t have cottage cheese on hand, and am on a really tight budget at the moment. What do you think? I wish I could help you, Luba, but I’ve never made this recipe without cottage cheese. I really don’t know. Sorry, translating everything into Russian is a lot of work. I’m sorry to hear that it didn’t work out for you, Julia. Maybe you can try to cook it longer next time. Hm, raw and watery? Maybe Julia forgot to add flour? I’ve been making your Frittata avery 2-3 weeks for breakfast, turns perfect every time! I prefer to use Ricotta, not cottage cheese when I have it on hand. 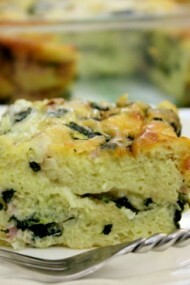 I have also substituted zucchini with broccoli and mushrooms couple of times just to try it! Thanks for such awesome recipe! That’s possible. I’ve never had it turn out runny either. I like to use ricotta cheese too, but I use whatever I happen to have in the refrigerator that week, either cottage or ricotta, they both work just as well. Broccoli and mushroom sound awesome in this recipe. Great idea, Nathasha. This is a great recipe!! I doubled the ingredients and used 9×11 dish for a company of friends, and it was a hit! Presentable and very tasty! Thanks, Olga! I’m so happy to hear that, Oksana:). Do you cover it with aluminum foil when you cook it ? 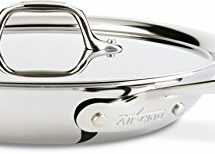 And will the type of baking dish you use affect cooking times cause mine turned out a little watery too so I’m keeping it inside for longer. No, I do not cover it while baking, Lana. 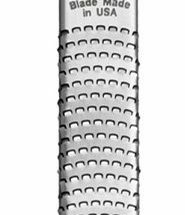 The type of baking dish will definitely have on impact on how quickly it cooks. 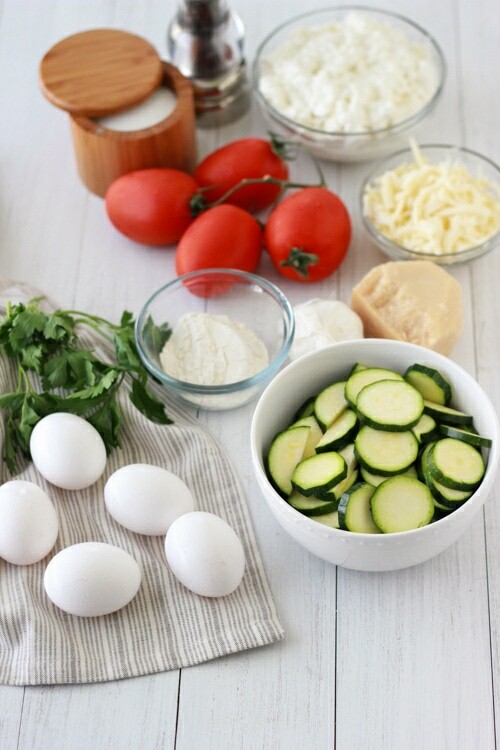 Also, if you don’t remove enough liquid from the tomatoes and the zucchini before you add them to the frittata, they will exude the liquid while baking and will make the frittata more watery. Also, the deeper the casserole dish, the longer it will take to bake. 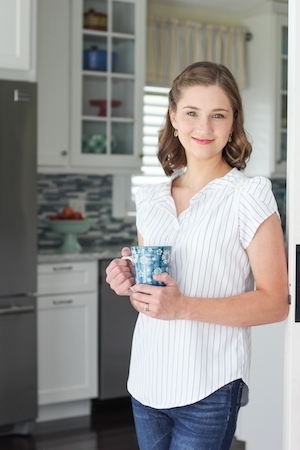 Another thing to consider is that oven temperature vary a lot, and some ovens are a lot hotter than others, so it will take less time to cook than others. You really have to base the amount of time not on what it says in the recipe instructions, but on how the dish looks. I hope that helps and it works out better for you next time. This looks delicious! Can I make this ahead of time and reheat before serving? Or can I serve this cold like a quiche? I haven’t tried to make it in advance, Yelena. I think it should work, but the tomatoes and zucchini may become more watery and soggy over time. Hi I did end up making it ahead of time and serving it cold. It was phenomenal! All of my guests loved it. Thanks for this awesome recipe. I’m so glad you enjoyed it, Yelena. Thank you for taking the time to let me know. Thank you for this wonderful recipe. It turned out beautiful and was a huge hit at my tea party! Love your recipes!! I’m so happy you enjoyed the frittata, Tina. Thank you for taking the time to write.